You do not have to ask permission to link directly to pages hosted on this site. We do not object to you linking directly to the information that is hosted on our site. We do not permit our pages to be loaded into frames on your site. We make every effort to check and test material at all stages of production. It is always wise for you to run an anti-virus program on all material downloaded from the Internet. We cannot accept any responsibility for any loss, disruption or damage to your data or your computer system which may occur whilst using material derived from our website. The DOVE Workshop information, products and services (or third party information, products and services), are provided ‘as is’ without any representation or endorsement made and without warranty of any kind whether express or implied, including but not limited to the implied warranties of satisfactory quality, fitness for a particular purpose, non-infringement, compatibility, security and accuracy. We do not warrant that the functions contained in the material contained in this site will be uninterrupted or error free, that defects will be corrected, or that this site or the server that make it available are free of viruses or represent the full functionality, accuracy, reliability of the materials. In no event will we be liable for any loss or damage including, without limitation, indirect or consequential loss or damage, or any loss or damage whatsoever arising from use or loss of use of, data, or profits, arising out of or in connection with the use of DOVE Workshop’s website. Accordance with the laws of England and Wales. Any dispute arising under these Terms and Conditions shall be subject to the exclusive jurisdiction of the courts of England and Wales. Get in touch through Facebook/Twitter or ring us on 01639 700024 if you’d like to find out more or register your interest in attending. 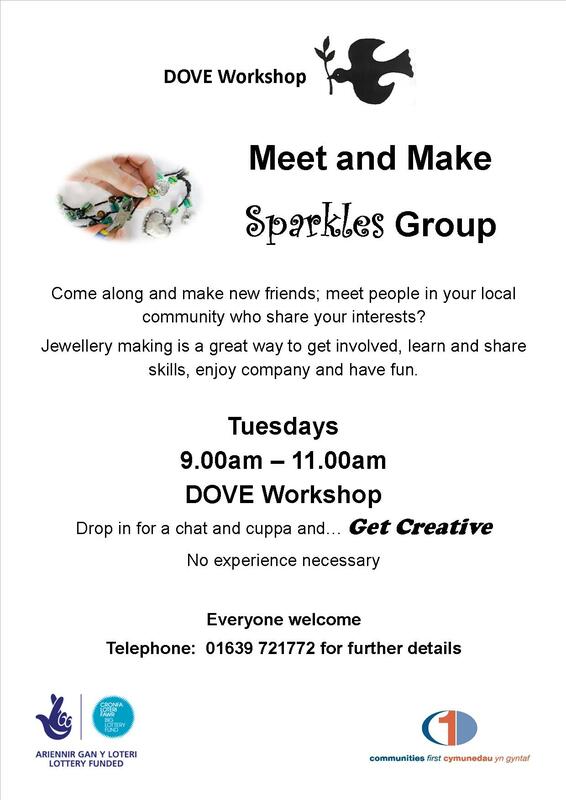 Why not come along and try your hand at making some jewellery? Please visit the courses section or download the Course Provision 2018/19 brochure for details of courses on offer. Please contact us if you would like to book a guidance appointment to help you choose a course. Each month we’ll feature an occupation highlighting the skills and qualities needed. Start with the pre-access to health professions course! The course will give you the confidence to study at a higher level; the level which health professions such as nursing, midwifery and general practice require you to have. The Pre-access to health professions will be running at Dove Workshop and Glynneath Training Centre at the end of January. Click on this link for more info.